Now that I'm sitting down to write up my thoughts on Bowdrie , I can't find my book. It's hidden somewhere in a book stack downstairs. I will unearth it as soon as I hit "publish" no doubt. At any rate, this book has been read. I was gifted with a copy of Bowdrie this past Christmas. (I hardly like to confess that.) This past week was quite busy and at the conclusion of it was Bookworm1's oral surgery. (The surgery went perfectly well! Thanks for praying and commenting on that!) I wanted a quick, engaging and distracting read and I found it in this book by Louis L'Amour. I get a kick out of L'Amour's westerns (which are the only things I've read by him, although he wrote in other genres as well). Reading a Louis L'Amour book is like watching a John Wayne movie. Sometimes you just want to do it. You can hear the drawl, you see the gun smoke and you want to wear a bandanna to keep the dust out of your eyes. This time I discovered that I even read his stories slow. You cannot read a Texas Drawl quickly. It just cannot be done. You savor every single word. Because you have to. Bowdrie is one of L'Amour's characters for which he wrote many short stories. Chick Bowdrie is a Texas Ranger who pre-dates Chuck Norris. He can best be described, I think, as a cowboy detective. As a young child, Chick Bowdrie almost because an outlaw when he was recruited by a Texas Ranger who saw potential in young Chick. Chick had ranger skills and so he was encouraged to uphold the law instead of living 'life on the dodge'. In Bowdrie we find him stumbling upon abandoned cabins and dead bodies left and right. He solves murders by following horse tracks and paying attention to how fast other men can draw their weapons. He keeps his mouth shut and his ears open and he holds himself steady when situations start to get out of hand. About the only thing that Bowdrie can't seem to handle well or figure out is women. Other than that, Bowdrie is the kind of guy you want around when people are thieving, angry scumbags. He was about as pleasant to be around "as an irritated porcupine." I'm so going to use that. Apparently there are two collections of Bowdrie stories: Bowdrie and Bowdrie's Law . (If I'm wrong about that, I'm sure someone will let us know in the comment section?) It is my understanding that there are 18 short stories about this character who is a delight and every bit the reading distraction I was looking for last week. I'm glad to have met him and I have no objections to reading more of him. From time to time I rather like a good western. Maybe I'm just in the mood these days. 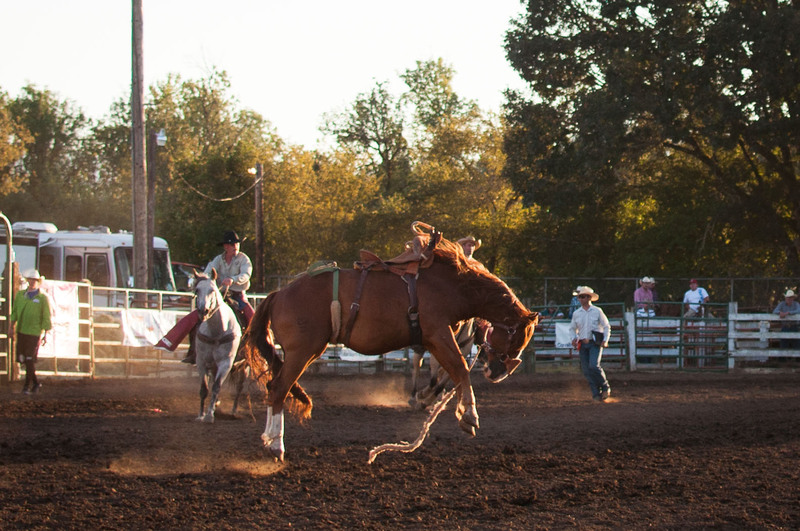 Recently we went to our first rodeo as a family. Yes, it was even my first rodeo. Despite the fact that I grew up in Texas, I never attended one. Had to do that in Oregon. My opinion? I thought it was fabulous! We got to see some bucking bronco's and some steer wrestling, both of which were very enjoyable. I'm sure we'll attend more rodeos in the future. We just got our feet wet with this one! I'm also just about sure that I'll be spending more time with good ol' Louis L'Amour. As long as I'm friends with Sky, L'Amour will be in the picture. And so I guess he'll be around a long, long time. "Bowdrie slapped the dust from his hat. "I'm a Ranger," he said, "and there's always work for a Ranger. Come to one trail's end, and there's always another. I kind of like it that way." Thank you, Sky, for sharing a part of who you are with me by sending me a copy of Bowdrie . Reading this made me happy because it made me think a lot about you! Love you! 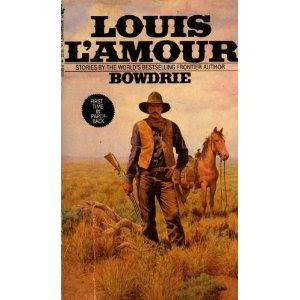 I've never read a Louis L' Amour, but I think I'd like to! What a great review of Bowdrie. I have to admit when I saw the title I felt a little incredulous. "Carrie reads L'Amour??" I thought to myself. I grew up reading these with my dad--I've probably read every one of his books (my dad subscribed to a club and rec'd the specially bound books one every 4-6 weeks) and many of them 2-3 times. I think I already told you Destry and Tyrell's names (although I added an 'l' to Tyrel Sackett's name) came from his books. His autobiography, Education of a Wandering Man, is still one you've gotta read. 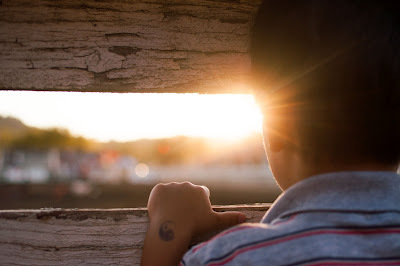 Wonderful inspiration for homeschooling mamas! Sheesh, I don't know what happened to my last comment. I'm glad you enjoyed Louis' book. Bowdrie is one of my favorite characters. I have read a few short stories out loud to our kids. They love hearing about the old west. I have also read, 'The Tall Stranger' and 'Down the Long Hills'. They particularly liked Down the Long Hills as it is about two children, sole survivors of an Indian attack on their wagon train, who travel by themselves and live off the land to make it to the next civilization, miles and miles away. I read Louis to sooth my soul and get my taste for adventure. It also helps with my riding withdrawals. And I usually need coffee even more! If you haven't seen, 'The Sacketts' movie with Sam Elliot, Jeff Osterhage and Tom Selleck, I highly recommend it for another taste of dust and guns! I've not read L'Amour. I might have to give him a try! If you are a fan of 12 century European history try The Walking Drum, its very good. I have never read L'Amour, but it's always been in the back of my mind to do so. You have strengthened my resolve. Glad to hear the surgery went well. I was praying!